Note that Contact information from 2011 may be out of date and links may take you to a legacy website. Alumni gathered at the Roosevelt Hotel for the Founder’s Day Dinner Dance to honor the 2011 Awardees: Wangechi Mutu (A’97) (Augustus Saint-Gaudens Award); Jesse Reiser (AR’81) and Nanako Umemoto (AR’83) (John Q. Hejduk Award); Charles Bliss (ChE’39/PDE’48) (Gano Dunn Award); Mina Greenstein (A’56) (Alumnus of the Year); Karina Tipton (CE’99) (Young Alumnus of the Year); and Dr. George Campbell Jr. 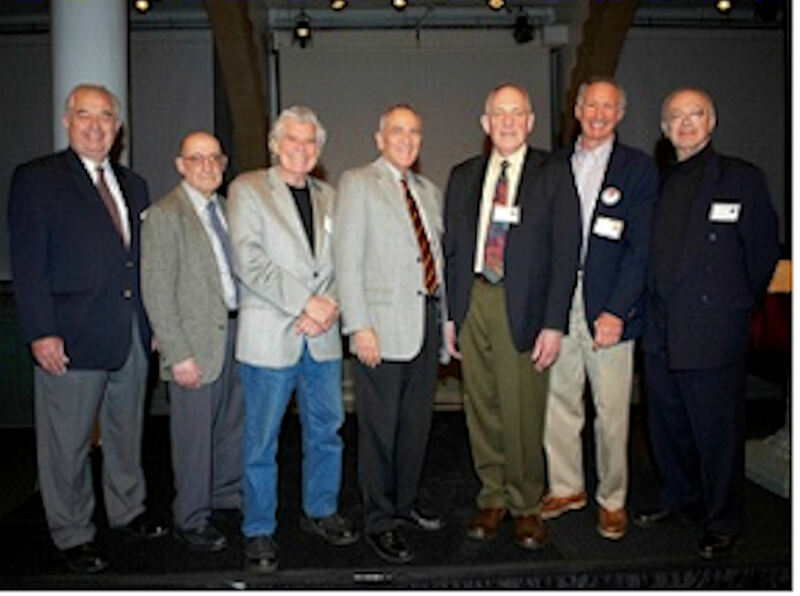 The Class of 1986 also celebrated their 25th ReUnion. Congratulations to the Class of 1961, who celebrated their 50th year anniversary at Golden Legion! Click here for more photos. 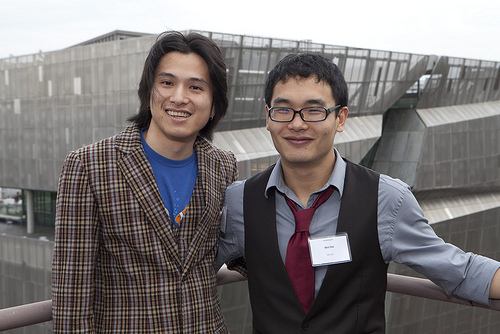 The Classes of 1995-2010 welcomed our newest alumni, the Class of 2011, at the annual On the Rooftop Party. 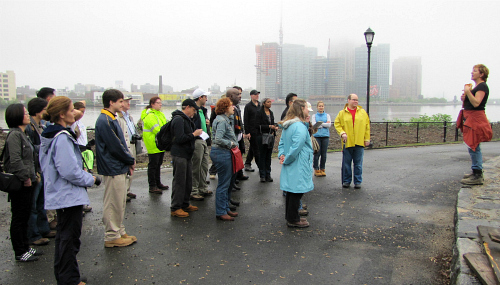 Gina Pollara (AR’91), Executive Director of the Franklin D. Roosevelt Four Freedoms Park, LLC, led a private tour for alumni of the park’s construction site. Coordinated by Rocco Cetera (CE’99), the tour gave a behind-the-scenes look at the project, which was designed by legendary architect Louis Kahn. Although the design was completed in 1974, the park at the southernmost point of Roosevelt Island is only now setting its completion date. In 2012, the park will open to reveal Kahn’s design, one of the last he completed before his death in 1974. 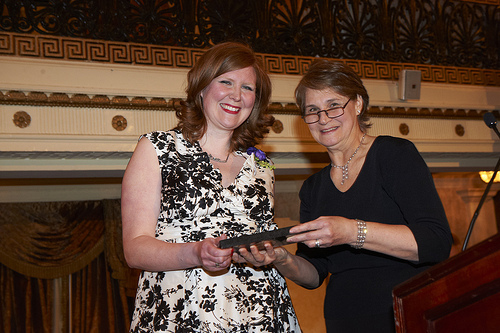 Click to view photos by Brian Rose (A’79) & Rocco Cetera (CE’99). Griffin Reilly (ME’02/MME’03) (center back row) has worked at Con Edison for the last eight years, and as an Adjunct Professor of Mechanical Engineering at The Cooper Union for the last five. Since he started teaching at Cooper, he has taken students on tours of the East River Cogeneration Power Plant, located on East 14th Street, with the generosity of Con Edison and the help of fellow alumni co-workers Margarett Jolly (ME’97), Christina Ho (ChE’02), Sheila Sorokin (ChE’00) and Lauren Fox (ChE’08). The most recent tours were on April 29 and May 6 with 16 students and two professors attending. The groups were shown the truncated combine cycle gas turbines and heat recovery steam generators, the Rankine cycle high pressure boilers and associated electric generators, the water treatment facilities and the modern control rooms of the plant. The CUAA is pleased to announce the newly elected Executive Committee, Alumni Council, Nominating Committee and Alumni Trustee Designate. The 2011 ballots were tabulated by the Tellers Committee chaired by Alfred Brand (CE’67). Peter is Chief of Operations Planning for NYC Transit. He worked at Metro-North Railroad for three years before joining MTA NYC, where he has worked for over 23 years in the Operations Planning Department. Since 2006, he has served as head of the department. He has served on the Alumni Council and Tellers Committee, and is on the Gano Dunn Award Committee. He is Class Rep Eng’83. Rocco is a project manager for the Port Authority of NY&NJ. He is a licensed engineer in the State of New York, a certified Project Management Professional and a LEED Accredited Professional. He serves as CUAA VP/Alumni Activities and on the Executive Committee. He has served on the Alumni Council, Alumni Film Festival Planning Committee and is Co-Chair of the Events Committee. In 2009, he was named Young Alumnus of the Year. Rob is President, CEO and CTO of InDorse Technologies, Inc. He is an Adjunct Associate Professor of Electrical Engineering in the Albert Nerken School of Engineering, and at the Polytechnic Institute of NYU in the Management of Technology Program. He serves as CUAA VP/Faculty and Student Liaison, Chair of the CUAA Faculty Committee and Chair of the CUAA Ad Hoc Mentoring Program Committee. He was Co-chair of the 2007 Founder’s Day Dinner Dance and serves on the Annual Fund and Executive committees. Robert is a Partner at Gerrard + Tan Architects. He serves on the Alumni Council and the Annual Fund and Nominating committees. He has served as Co-chair of the Annual Fund Committee. He and Judy Gerrard AR’83 were co-chairs of the 2009 Founder’s Day Dinner Dance. Carl is a consultant in aviation and transportation. He worked for over 30 years for the Port Authority of NY&NJ. He has been an Adjunct Professor of Civil Engineering at Cooper Union for more than 30 years. He has served as the CUAA President, VP/Faculty Liaison and VP/Alumni Activities. He has served on the Alumni Council and Nominating, Gano Dunn Award and Executive committees. Ray is Managing Director at Cain Brothers, leading the firm’s franchise in Healthcare Information Technology and Pharmaceutical Services. Previously, he was a sell-side equity research analyst for 10 years, primarily at Bear Stearns. Prior to Wall Street, he worked for five years at ML Systems, a start-up focused on energy efficient lighting products, where he held various positions ranging from Engineering Manager to National Sales Manager. He has served on the Alumni Council and co-founded and serves as Co-chair of the Cooper Union Wall Street Affinity Group. He is a member of the Sarah Amelia Hewitt Society and is Class Rep Eng’86. The objectives of the Alumni Council are to provide service to alumni, service to the college, financial support to the college and recognition of alumni. Each of the 36 Alumni Council members serves a three-year term. The following newly elected members, whose terms run from July 1, 2011 through June 30, 2014, will join those continuing on the Council. The Nominating Committee identifies alumni who will lead the CUAA in years to come. Composed of the two most recent CUAA past presidents and 10 elected members, the committee will nominate the Executive Committee slate for 2012-13. 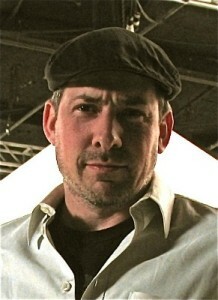 Julian LaVerdiere (A’93) is Production Designer and Owner of LaVerdiere Design LTD. He serves on the Alumni Council, the Augustus Saint-Gaudens Award Committee and is the Alumni Representative to the School of Art Curriculum Committee. In 2002, he received The Cooper Union Urban Visionaries Emerging Talent Award. We interviewed him on his art, the impact of Cooper on his work and what drew him to become involved with the CUAA. A: I am art directing Sacha Baron Cohen’s new film The Dictator. It has been in pre-production all spring, and shooting here in New York City has just begun and will follow through the summer. The project is totally absurd and lots of fun. We have designed a tyrannical palace filled with vulgar art and a cool secret weapons lab equipped with clandestine nukes. It has been a total teenage boy’s dream job. 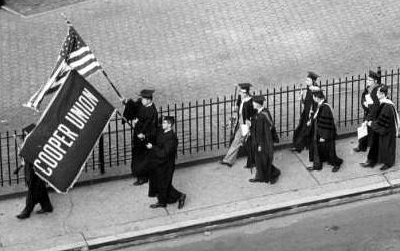 Convocation procession entering Peter Cooper Park, 1959. The Cooper Union Library presents the first searchable digital collection from the Cooper Archives with The Cooper Union 100th Anniversary Photographs. The collection includes 199 scanned photographic events depicting the 100th anniversary of The Cooper Union that began in 1956 and concluded in 1959. Click here to access the collection. Congratulations to the Class of 2011, the newest members of the CUAA! Commencement on May 24 featured an address by journalist and author Malcolm Gladwell. Read more. The FY 2010 Donor Lists are now available online. We gratefully acknowledge all those whose generous contributions have provided vital support for The Cooper Union during the past year. Click here. Thousands came out to the Festival of Ideas for the New City on the Bowery, held May 4 to 8. The festival was conceived by the New Museum, with The Cooper Union as an organizing partner in the collaborative initiative. Diane Lewis (AR’76) participated in a roundtable discussion on The Reconfiguration of the Lower East Side, presenting the work of Diane Lewis Architects PC. Paul Villinski (A’84) exhibited his Emergency Response Studio, Elizabeth Diller (AR’79) participated in a discussion on The Reconfigured City, thesis student Audrey Berman (A’11) exhibited a mobile bakery, and student works reflecting festival themes were exhibited in the Foundation Building and 41 Cooper. OurGoods, co-founded by Caroline Woolard (A’07), Richard Watts (A’08) and Louise Ma (A’07), had a booth where participants could barter for goods and services. The after dark exhibit of light installations, Nuit Blanche, included work by Kant Smith (A’07). Read more. Recognizing the accomplishments of CU alumni, the Hall of Fame includes nearly 300 distinguished individuals. This year’s Presidential Citation awardees are the newest members of the Hall of Fame, having been honored at the 2011 Commencement ceremonies. Click here to read more about Max Becher (A’86) and Andrea Robbins (A’87), Catherine Seavitt-Nordensen (AR’94) and Richard Sarles (CE’67). 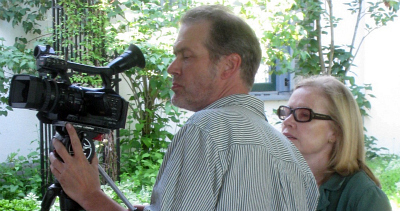 Director of Photography Kevin Cloutier & Producer/Director Janet Gardner (A’65) filming outside of Ringwood Manor, Ringwood, New Jersey. Janet Gardner (A’65) and Mitsuko Brooks (A’05) of The Gardner Documentary Group recently won a 2010 CINE Golden Eagle Award for the film, Mechanic to Millionaire: The Peter Cooper Story. This month they are also being honored by the New Jersey Chapter of the Society of Professional Journalists for enterprise reporting on television. In the fall of 1948, while I was in my senior year at the High School of Music and Art in Manhattan, I took the entrance exam to The Cooper Union. It was the first step in a life changing chain of events that led to a career, a wife, a family and many good friends… Read more.